What can you buy for R2.40 per day? We all know that hygiene is important. You need to wash your hands before you eat and after using the toilet to protect yourself from harmful germs. 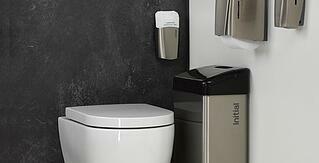 You protect your company’s image by keeping your bathrooms neat and smelling fresh. Your business may even have some legislative requirements around hand washing. As an employer you need to add a layer to this conversation as hygiene directly impacts your company’s absenteeism. Without sounding insensitive, having colleagues off ill is expensive. If you need a reminder of how expensive absenteeism can be, check out our blog on Your business is losing 100s of days a year. When it comes to hygiene for your company there are generally two options. Some opt for a professional service provider to keep their office environment hygienic while others rely on a do-it-yourself solution. I like to refer to the latter as a D-I-WHY solution. WHY would you want to do it yourself when you can have the Experts look after your business? We face objections to the purchase of hygiene services on a daily basis. People argue that it’s not a specialist service and therefore a daily cleaner can do it, others say that their business is too small to warrant a professional hygiene service provider. But the the main objection we always face is COST. I’m sure you’re already thinking that this looks like it’s going to be expensive! As a matter of fact, this solution would only cost you R 2.40 per person per day if you engage with Initial. It’s difficult to equate R 2.40 to anything these days so I would like to focus on the total daily cost of R 72.00 for your office per day, so that it’s a bit more tangible. What can you buy for R 72.00 per day? Getting a good hygiene solution from a reputable supplier doesn’t cost as much as you expected, right? You might say that it would probably still be cheaper to do it yourself. Another myth. Looking at our list of products and services you may be able to make a few substitutions to match the above but there are a few items that might be rather tricky. For example, with hand soap you may want to compare millilitre for millilitre. Because of the dosage difference and varying quality of soap, your DIY solution may be more expensive just on these factors. To take it a step further and consider pilferage or the fact that the pump bottles may be disposed of when they still contain soap. You also need to look at the actual bottle. After a week that pump section starts getting grubby which makes me wonder if you aren’t just contributing to cross contamination. You might also think that your daily cleaner can perform a thorough deep clean. Unfortunately your daily cleaner does not have the knowledge, the disinfectant fogging equipment nor the bio enzymes required to perform a proper Initial deep clean. Don’t see what a fuss is about. Why not book a survey and include a AHT demo? You also need to consider other factors; for example you need to take the time to make a list of your hygiene needs. Then you need to drive to the store to shop or order online. If you have run out of an item you need to drop everything you are doing to arrange or to go buy the items. To find out how Initial could help you with you hygiene services, give us your details and somebody will contact you to discuss your hygiene requirements. Want to get all our latest articles delivered straight to your inbox? Subscribe to our blog and never miss a post.